Today I bought Baader AstroSolar filter for sun observation - it reduces brightness by a factor of 100'000 (OD5). The following photo was made by Sony 500mm/F8 lens and A77ii - my first semi-transparent mirror camera: finally I can observe the sun without fear of retina burn if something happens with the filter. Exposure which allows to see the spots is 1/800 at ISO100/F8, without filter it would require exposure of 1/80'000'000 seconds - which is unrealistic. Full 14-bit resolution is needed to see the spots without excessive noise. In the future it might be beneficial to normalize sun brightness variation across the area - this should help with the spots close to the edges. 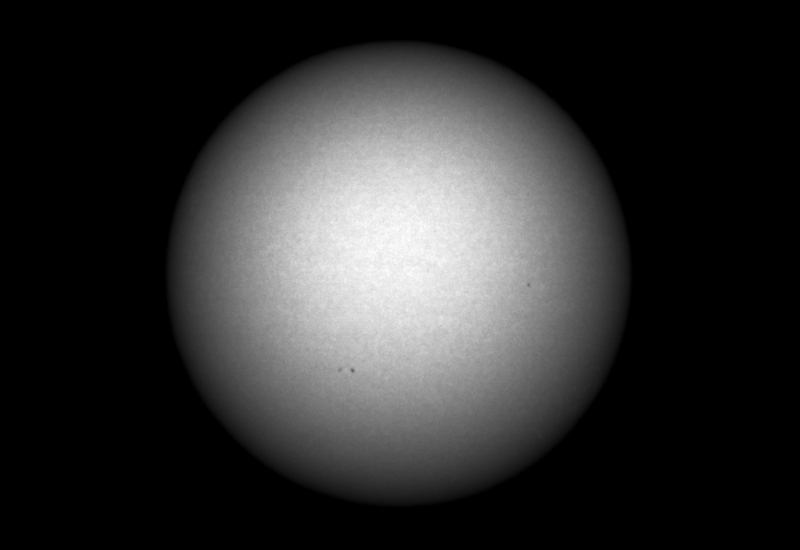 Sun is currently near maximum of it's activity - but on this photo we can only observe 3 tiny spots, that's abnormally low. During maximum activity total number of spots could reach 250 - this should be more spectacular. I remember first time when I tried to observe sun ~7 years ago with 50mm/30x spyglass and floppy disk "filter". I made a fatal mistake then: i placed "filter" on the eyepiece side, and obviously sun immediately burned through it as soon as I found the sun. Luckily, it didn't get retina burn that time.